My son turned 15 at the beginning of the month. 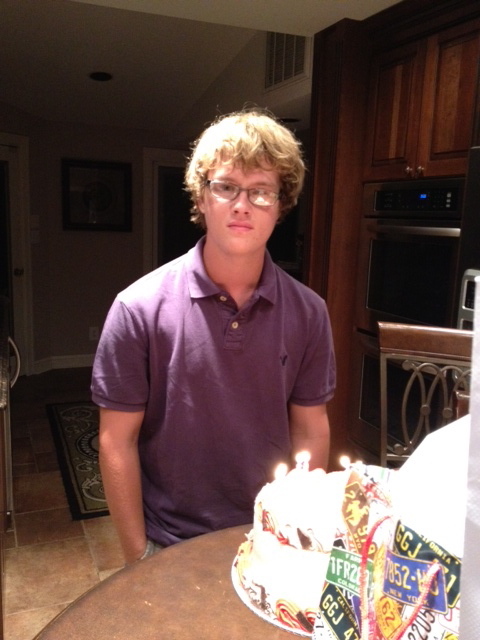 15 already;-( Well this young man looks nothing like he used to at his birth at a low weight of 1lb. and 4oz. ( he was born at 24 weeks). Today he is almost 6 feet and weigh 180 lbs. 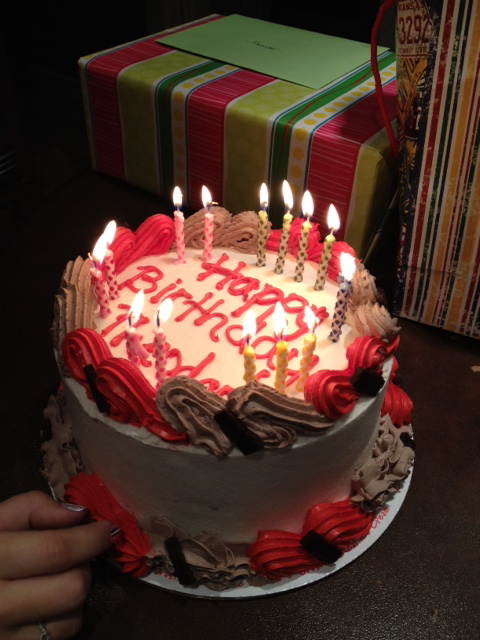 His birthday fell on a weekday so we had a party for it the following Sunday with all the uncles, aunts and cousins. He wanted to have an ice-cream cake so I went to the closest ice-cream parlour and bought him a cake. Of course I was not going to serve a bought ice-cream cake to my guests. I am a much better host than that. 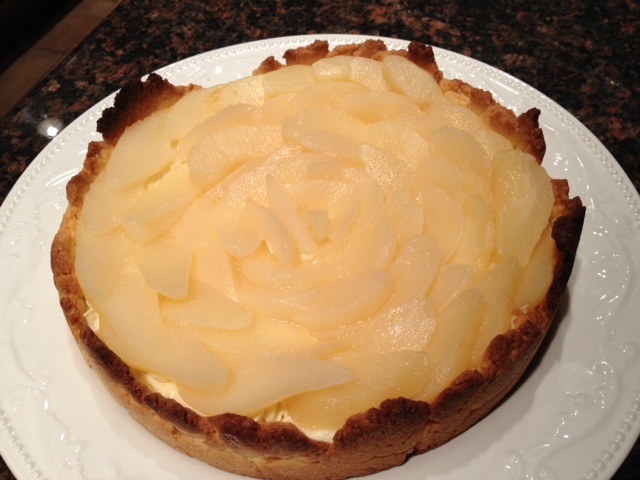 Instead I decided to make a pear tart with a maple custard cream. This recipe is for a 9 inch pie or for about 6 3 1/16 individual pies. 2-4 tbsp of maple syrup. 2/3 pears or 1 can of canned pear halves. Ingredients for the pate sablee ( or shortbread pie dough): 2 sticks of butter at room temperature, 3/4 cup of sugar, 2 cups of flour, 1 tsp of salt. In a mixer beat the butter and the sugar until it fluffs up and becomes a pale yellow. Reduce the speed and slowly add the flour and the salt. Mix until the dough becomes crumbly. Do not overmix. With your hands, shape a ball then cover the ball with some plastic wrap and let it cool in the fridge for 30 minutes and up to 2 days. Turn the oven to 375. Remove the dough from the refrigerator, place the dough on the large roul’pat, and with a rolling pin, roll a 11 inch circle if you want to make a large pie or cut small circles using the dough cutter of of 3 1/16. Place the dough into the large round mold or in the opening of the medium tartlet tray. Perforate the dough with a fork. Place a parchment paper over the dough. Fill the parchment paper/ pie with some dry white bean and cook the dough at 375 for 15 minutes. When it is cooked, remove it from the oven, and let it cool. When it is cooled, remove the beans and the parchment paper and set aside for later use. While the pie is cooling prepare the maple pastry cream. Ingredients for the maple pastry cream: 1 cup of whole milk, 1/4 cup of granulated sugar, 3 large egg yolks, 2 1/2 tbsp of cornstarch, 1/2 cup of whipped cream, 2-4 tbsp of maple syrup. Pour the milk into a small saucepan and cook the milk until it is almost boiling. Meanwhile, beat the egg yolks with the sugar until the mixture is becoming lighter in color and is becoming fluffer. Add the cornstarch and mix well. Pour the milk slowly into the egg mixture while stirring. Place the mixture back onto the stove and cook at a medium temperature until it is becoming really really thick. Remove it from the stove.Place the mixture into a bowl and into the fridge to cool. 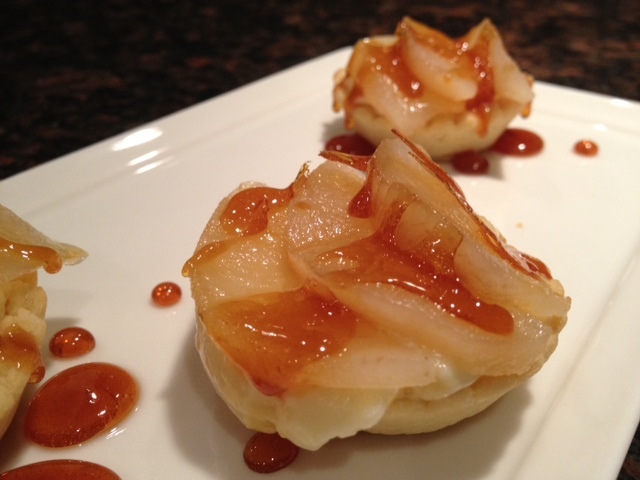 Poached Pear: 2 to 3 pears, 1/2 cup of sugar. Peel the pears and slice them thinly. Place the pears on the flexipat. Drizzle 1/2 cup of sugar over the pears. Cover the pears with a medium silpat and cook for 10-15 minutes or until the pears are poached and tender. Let them cool. If you do not have time, you may use canned pears. They are a great substitute. When the pastry cream is cooled. Slowly add the whipped cream to the pastry cream. Also flavor the cream with the maple syrup. You may use 2-4 tbsp of maple syrup. To prepare the pies. Place the cream into a plastic bag and pipe the cream into the pies. Lay the pears slices over the cream superposing them. For the small tartlets you will only be able to place 3 to 4 slices. For the big pie you will place the pear slices going around the pie crust. 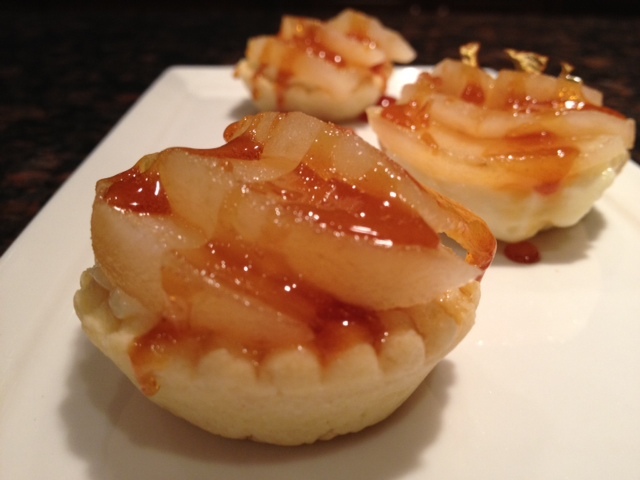 For added decoration I drizzled some fresh caramel over the pear tart. Making caramel is quite easy. You place 1 cup of sugar into a small saucepan and you place the saucepan onto the stove at medium high temperature. Do not mix, just be patient. The sugar will start dissolving and will start to get an amber color on the outer rim. At that point start stirring until the caramel is a light golden color. With a spoon, drizzle the caramel over the pies et voila!! !